Oh what you forgot that we got engaged? it’s okay, we did too. Between new jobs, surprise parties, conferences, and all things crazy we sort of forgot that we are supposed to be planning a wedding. We had debated starting a little sister blog just for wedding planning so that we could over-share all of our plans and ideas, but then I thought about how complicated things could get and scratched the whole idea. Scratched it faster than I could say “domain name”. So we will be sharing some wedding details here and well, here. Hope you all can get as excited as we are. If it totally annoys you, then you should probably avoid my Pinterest account at all costs. So what do we have figured out? Not much. We have a tentative date….10-4-14 although we heard that is hunting season. Maybe a hunting themed wedding, no? I often ponder all the fun things we could do with that date (10-4 good buddy). Plus, Tim would never forget our anniversary and that fact alone forces it into winnerhood. We do know our wedding party, and it’s very unique…although we haven’t “officially asked” them yet. There’s something special in the works for all that. Don’t worry, you will be the second to know. Our biggest struggle is going to be a venue. We aren’t very traditional, so all the typical places are off the table. Anyone know of a big empty warehouse or field we can borrow? Which leads to our biggest decision….elope in Maine or throw the biggest party Missouri has ever seen? Remember how we fell in love with Camden, Maine last year? It would be a perfect place for a sweet little ceremony, and then we could use all that money we saved to get some hardwood floors. Then again, I want our first dance. I want to see all my friends laughing, and I really want to shove cake in Tim’s face. I just don’t want to have to cut a guest list thanks to our meager budget….which is why we had the idea to throw a fair. Yes, you read my crazy scheme correctly. I want to throw a fair, filled to the brim with cotton candy. A live bluegrass band, real rides, and tons of fun had by all. Maybe a gorgeous gold dress. Any idea how to make that happen. Where there’s a will there’s a way, I hope. We are going to look at Lost Hill Lake this weekend, wish us luck! I feel like once we have a venue the ball will really start rolling. Please tell me that’s the truth and that I am not doomed. What kind of wedding did/will you have? Should we elope or have a big, crazy shindig? Think we can pull off a fair? Christina, A fair sounds amazing!!! Such a fun theme. Whatever you do, do it for you. If you still want to go to main, it doesn’t have to be an elopement. We did a “destination” wedding at the Cape Hatteras light house in the Outerbanks of NC. With enough warning about 50 people made the trip from MN, TX, and VA. Our biggest single expense was about $1000 to rent a beach house for the entire week, but it housed our entire wedding party, too. Everyone made a vacation out of it :). Best of luck planning! A fair sounds exciting! I love a snow cone. Our wedding was a typical church wedding in November, but we had it at night and the entire ceremony was candlelit. We had luminaries lining the walkway outside and, what felt like, a million candles inside. When we lit the unity candle, everyone received candles of their own to hold for the remainder of the ceremony. We also had a harpist. It felt very intimate, however, if we could do it again we would totally do something different. Or maybe a fair. Go with the fair. Oh my gosh Brad….that brings a tear to my eye. Seriously, that sounds so, so….magical! I bet it was so beautiful. We had the same debate – we ended up with almost three years to plan our wedding thanks to the military. Initially we were torn between eloping before or having a mega party after. We went with mega party and I could not be happier! It was everything I wanted it to be. I know everyone is different, but for us eloping would have left me feeling like something was missing. I am so, so happy we waited and threw a killer party! Sorry – I meant that to say before or after the deployment! So glad to hear your wedding was so awesome!!! Do yourselve a favour and go peruse OffbeatBride.com. I did when I was planning ours, although not being based in the US, it was of limited use to me. BUT they do have a wonderfully creative bunch of people who hang out there who have done all sorts of weird and wacky wedding things. You’ll find lots of nice ideas! Tim thanks you for giving me another reason to stay glued to my computer hahaha. Thanks Tara!!! 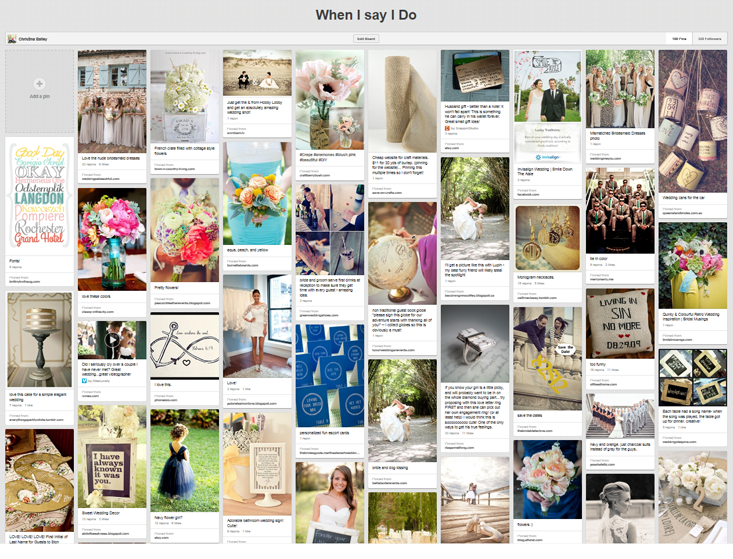 I would have been SCREWED if I had gotten married in the ‘age of Pinterest’! TOO MANY IDEAS!!! I know your wedding will be beautiful! You know whats funny though….there are so many great ideas but I don’t like when I go to a wedding and EVERY. SINGLE. THING. came from Pinterest….I am hoping that we can come up with a few unique ideas (fingers crossed). Now that I said that I’ve probably doomed myself to have a Pinterest-themed wedding!!! I might as well have my bridesmaids where red dresses with a big white P on them hahaha. I’ll be right there with you no matter where you tie the knot! But I am in love with the fair idea! DO eeeeeet! Awwwwww that melted my heart a little. Wait till you see my dress idea….you. will. die. I hope you don’t literally die though….I kind of need you there. LOVE! Congratulations!! Where there is a will, there is a way. My hubby and I were laid off 3 months before our wedding, so we had a shoestring budget, but we didn’t want to postpone our life together, so we took the leap anyways. We DIY’ed nearly everything, and the kindness of our friends who volunteered to help us was beautiful and humbling. We printed the invitations ourselves and I addressed them myself (I am a calligrapher), a friend volunteered to bake the cake and another did the photography. We had 300 people and didn’t break the bank. My sister found a designer dress 90% off on clearance, I did the flowers myself (we bought flowers from Sam’s), we served Stouffers Lasagna and salad, and it was great. Email me, I can send you the link for pictures. I am SO glad you said to email you….because I have about a million questions now hahah! Did you teach yourself calligraphy? So there wasn’t Pinterest when I got married and I had to make do with magazines and The Knot… I can’t even imagine the craft/ DIY overload!!! SO exciting!! But we have to wait until 2014?! Booo…. Love the fair idea. LOVE!! Ummmmm you know I am a super creep, super creep….I’m super creepy 🙂 Can’t wait to check it out!!!! We had a tiny affair. We got married with 8 people in attendance. We had a small reception at a friend’s house with cake and food. I have a few regrets about not having our first dance and all that, but we were married in a church and we had the wedding we wanted. We spent only $250, including rings. Yes, you read that right. In the end, the wedding isn’t what mattered to us, the marriage is. Do what makes you two happy, nothing more, nothing less. If you do what you want, you won’t regret it. I think so many people get caught up in the party planning that they forget they are agreeing to spend the rest of their lives with someone. And HUGE ROUND OF APPLAUSE to you for getting married for $250. That’s awesome!!! 10/4 is my anniversary as well! I live in MO as well and we got married outside of Columbia. It will be 5 years this year and, yes the 10-4, good buddy jokes never get old.